As the healthcare industry prepares for the October transition from ICD9 to ICD10, many organizations are dealing with the obvious issues. Computer systems are being upgraded to handle the new codes, health plans are developing new business rules for reimbursement, coders and physicians are being retrained. These are all necessary steps in the adoption of these codes, but some of the most difficult issues will not be in dealing with the new codes, but transitioning to them as these systems are implemented. One of the strategies in dealing with these types of transitions is to look toward similar situations in the past. How did this impact you last time? What issues came up that you did not anticipate? These transitions are never smooth, but they have to be dealt with. Experience is the best teacher. However, in this case, we have no recent experience with any change of this magnitude. Our organization has been in business since 1986. We began sending claims electronically in 1994. Even before electronic claims, ICD9 was the standard code set for diagnoses and procedures. Although individual codes have come and gone, this code set has been the same one used for many years. The largest similar transition in the industry was when the standard for claims was changed from the fixed length records of the National Standard Format (NSF) to the ANSI 837. This standard was introduced through HIPAA 1996, but was not mandated by CMS until October of 2003. Even today, many health plans cannot receive claims in this format directly and depend on clearinghouses to process the 837 files created by provider systems. Like this previous transition, we now see CMS leading the way toward implementation of ICD10. They are the first ones providing test environments for end-to-end processing of these transactions. They will be the first ones requiring them for payment. Since the transition from NSF to 837, there have been significant changes in how claims have been processed by CMS and other health plans. Our experience from this particular transition was so long ago that many of the lessons we learned are not relevant today. However, I believe that the relatively recent transition from the ANSI 4010 837 to the ANSI 5010 837 standard claim format provides us with relevant experience in dealing with the ICD10 transition as well. This experience can provide us with insight on how this transition will take place and what types of problems we can anticipate and prepare for. When we transitioned from 4010 to 5010, CMS created new contractor systems supporting the 5010 format. As providers and their vendors became prepared to produce claim files in the new format, they created test batches and sent them in test mode to the new contractor systems. The 999 and 277CA files sent automatically in response provided the information necessary to determine if the batches passed this test. If they did not, they contained information regarding the issues that needed to be addressed. The providers and their vendors were then able to fix and resend these batches while production claims continued to be processed in the 4010 format. Once the claims passed testing, the new CMS system automatically classified the submitter ID used for the valid test file as “in production”. Once the provider was ready, and prior to the conversion deadline, the provider began sending all claims in the new format to the new system and discontinued the previous process. It looks like the conversion from ICD9 to ICD10 will follow a similar procedure for CMS. The new test systems are separate from the production ones and providers can test with this system now while continuing to send production claims with ICD9 codes to the current system. This worked well for the transition from 4010 to 5010 with CMS, at least for those organizations that were prepared. However, the transition did not go smoothly for the industry as a whole. When CMS eventually required that all claims sent were in the new 5010 format, other health plans were still not able to accept the new format. This was especially true for Medicaid systems. For example, for over a year from when CMS required the 5010, Medi-Cal, the California Medicaid program, would only accept claims in the 4010 format. This meant that systems and procedures had to be put in place to create claims in either format, depending on who was receiving the claims, long after the new format was required by CMS. In our particular product, 837Direct, we dealt with this issue by supporting both file formats at the same time. Our customers could select each entity receiving these claims files and designate them as test or production and 4010 or 5010 and control this transition by health plan without external support. Both formats could be supported at the same time until all claims transitioned to the new format. This transition only occurred a few years ago and it was not nearly as significant as the ICD9 to ICD10 transition. Learning from this experience, we must assume that we all need to be prepared for a transition period where some health plans require the ICD10, with CMS, the largest, being the first, and others to follow behind them. During the previous transition, our customers only had to keep track of when each health plan converted to the new claim format, when they had passed testing, and indicate in the master file when they wanted to switch file version for outbound claims. No process or procedure upstream of this process was significantly affected. Even so, many providers felt a pinch in their cash flow when claims processing was delayed as the participating organizations dealt with these issues. This time it will be different. I think we can assume that once again CMS will require the ICD10 for a period of time when other health plans will be incapable of accepting them. I also think that this transition will be slower (longer) than the transition from 4010 to 5010 because of the complexity of the changes at both ends (payer and provider). This time the transition affects many procedures, including those conducted long before a claim is created. Learning from this previous experience, it will be the providers who will suffer the impact of this transition through payment delays. There will be no way to avoid it entirely, but knowing that this will happen can allow providers to prepare as much as possible. Any steps you can take now to accommodate this situation will mitigate the future damage. As we have learned in preparation for ICD10, the system for coding in this new standard is more detailed than its predecessor. 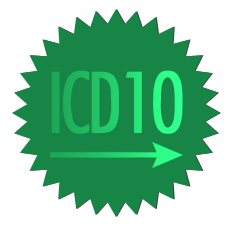 There is no way to convert ICD9 codes to ICD10 or the other way around. This means that you will need to be prepared to code all patients both ways during the transition period, for as long as this might be. This means doubling your coding staff or services. Your systems that prepare claim data for payment will need to be able to provide ICD9 codes for some health plans and ICD10 codes for others. It will need to be able to collect either code type, or both, for the same patient for the same date of service until the industry transition is complete. These claims processing systems will need to be smart enough to know which diagnosis codes belong in the claim files they create based on the health plan receiving the claims. Like the 4010/5010 transition, we intend to provide tools to our customers in 837Direct that will allow them send the correct code to health plans based on their transition status and to check for the correct codes based on this status and the service dates on the claims. If necessary, we can send both code sets on a claim. You will need to test with systems other than CMS in order to switch from one format to the other and this testing will depend on the readiness of the health plan to accommodate the new codes which will be staggered through a long period of time. You can expect delays in payment from claim files, even those sent correctly and in production, as the health plans work out bugs in their reimbursement logic. Many provider organizations are preparing for the transition to ICD10 as if CMS was the only other entity involved. If this was the case, everything would be much easier, but it is not. Your transition plan needs to take all of these issues into consideration if you depend on revenue from other health plans as well.